During the final day's play in the fifth Test between England and India at the Oval, seam spearhead James Anderson embellished his name in the record books. The 36-year old overtook Glenn McGrath's tally of 563 wickets to become the most prolific fast bowler in the history of Test cricket. Going into the fifth Test, Anderson had needed just five wickets to procure the all-time record from the Australian legend. After picking two wickets in the first innings, he inched closer by removing Shikhar Dhawan and Cheteshwar Pujara during the penultimate day. When he castled Mohammed Shami in the last session of the match, the modern-day swing icon not only sealed England's 118-run victory but also ascended to the summit of pace bowling in Test history. 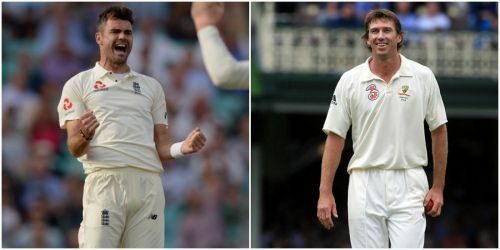 With 564 wickets from 143 Tests, Anderson is now perched on top of the list of all-time fast bowlers in the purest format of the game. When the historical list is expanded to include spinners as well, only the illustrious troika of Muttiah Muralitharan (800 wickets), Shane Warne (708 wickets) and Anil Kumble (619 wickets) stand above the England seamer. Aside from Anderson and McGrath, West Indies stalwart Courtney Walsh (he held the all-time record at the time of his retirement) is the only other fast bowler to possess more than 500 Test wickets. Outside the top three, there's a significant difference in the wickets tally as decorated Indian all-rounder Kapil Dev occupies the fourth spot with 434 wickets. Close on his heels is Stuart Broad. At the moment, the 32-year old England seamer requires only two more wickets to leapfrog him. From just 86 Tests, Sir Richard Hadlee managed to amass a whopping 431 wickets. South African greats Dale Steyn and Shaun Pollock have collected 421 scalps each. The active 35-year old, who is on the cusp of snatching the Proteas crown, has taken an identical number of wickets from 20 lesser matches when compared to his erstwhile teammate. While Pakistani wizard Wasim Akram picked 414 wickets from 104 Tests, the venerated Sir Curtly Ambrose rounds off the top ten with 405 scalps. The fact that only ten fast bowlers have gone past the 400-wicket mark reiterates the value of endurance. Among the ten most prolific fast bowlers in Test history, Ambrose and Steyn possess the best average (20.99) and strike-rate (42) respectively.